"You may be the hottest bush pilot this side of Mos Eisley, Luke, but those little skyhoppers can be dangerous. They move awfully fast for tropospheric craft—faster than they need to. Keep playing engine jockey with one and someday, whammo! You're going to be nothing more than a dark spot on the damp side of a canyon wall." The T-16 skyhopper was a high-performance airspeeder. "T-16s are a lot like the snubfighters we're using." "I know, I looked one over. I'm sure I can handle it." The Incom Corporation T-16 Skyhopper was equipped with an ion drive and a fully pressurized cockpit, allowing it to operate at trans-orbital altitudes. Civilian versions of the skyhopper were armed with pneumatic cannons, and were equipped with targeting lasers though many law-enforcement agencies and planetary militaries throughout the galaxy utilized modified T-16s due to their overall good performance. However, because it was armed with only a single mounted repeating blaster, it was often overlooked by the military. Even so, these airspeeders were often used as training vehicles by the Rebel Alliance, due to the fact that their flight controls were similar to those of X-wings. The skyhopper was a common sight across the galaxy, with versions of the craft found on nearly every settled world. The T-16 was identified by its tri-wing design and triangular cabin. The three wings, which were reproduced in countless Imperial transports, provided excellent stability. The central airfoil segmented the canopy and blocked much of the pilot's view, but computer displays and a holographic mapping system compensated for this decreased field of view. The speeder had a top speed of approximately 1,200 kilometers per hour, and the two repulsor generators provided lift up to 300 meters. Many young pilots preferred skyhoppers over landspeeders because of the increased maneuverability. Luke Skywalker owned a T-16 on his home planet of Tatooine, where he would use womp rats as target practice and race through Beggar's Canyon with his friend, Biggs Darklighter. After an incident where Skywalker "threaded the needle" during a dangerous run through Beggar's Canyon, the T-16 ended up undergoing repairs at the Lars Homestead, repairs that were ultimately not completed by the time of the battle between the Tantive IV and the Devastator. Six months after the Battle of Yavin, two T-16s were flying through Beggar's Canyon when the Empire raided Mos Eisley. The MT-16 was a T-16 modified by the New Republic with a blaster cannon for light combat. In A New Hope, Luke is seen playing with a model of a T-16, which in reality was the prop miniature built by Colin Cantwell. The actual prop could not be completed, and an incomplete hull can be seen as a matte painting in the background. His T-16 was ruined by Luke in-universe so he used his landspeeder to search for R2-D2. A flying T-16 can be seen above Mos Eisley during the Return of the Jedi Special Edition's celebration ending sequence. In Attack of the Clones, a T-16 can be seen in the background of the homestead garage scene. In the 1998 video game Star Wars: Rogue Squadron, the first bonus mission is a T-16 skyhopper race between the player (Luke Skywalker), Wedge Antilles, Zev Senesca, and Dak Ralter. In the game's sequels Star Wars: Rogue Squadron II: Rogue Leader and Star Wars: Rogue Squadron III: Rebel Strike, the player flies a T-16 for the non-canon training. Some of the speeder points (flight paths, in MMO terms) in the 2011 video game Star Wars: The Old Republic use a vehicle of similar design - also referred to as a skyhopper - to travel to various points. The skyhopper is most often used on Balmorra and Voss, due to their largely mountainous terrains that inhibit the use of regular speeders. A pair of T-16 skyhoppers. 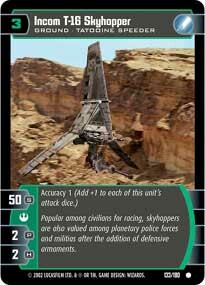 Wookieepedia has 27 images related to T-16 skyhopper.